So the rumors are verified. TALAS does in fact have its own guillotine! Built some 50 years ago, this machine is still rock-solid (and we’re not just referring to its sheer weight). 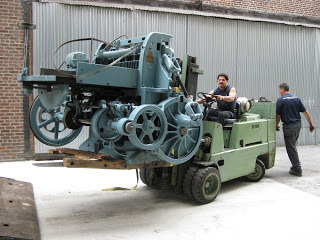 When researching a cutter, we were told that for the type of materials we we would be predominantly cutting (which is a very dense binders board) that we would want to find the oldest machine out there. While new machines come equipped with all sorts of snazzy bells and whistles, they’re really meant to cut PAPER! Clearly that wasn’t going to fly with our needs… we would need something that was built tough enough to stand up to the materials that it would be cutting. In anticipation of the machines arrival, we broke down pallet racks & cleared a wide open path for the riggers to bring in the machine onto the ground floor. At first the forklift was used to pick up the cutter on the bed of the truck. The winch was connected, the truck was tilted back, and the 39,000lb package was slowly lowered with the winch down to the ground! From there it was pretty smooth sailing to its final resting place against the back wall of the building, and with minimal effort the riggers had it off the forklift, leveled out, and attached the side tables. A few days later once we had an air compressor installed, a separate team came back to outfit the machine with blades, cutting sticks, and other small parts. Now we were ready for the fun part: training! Most of the training resolves around how to change the blades and how to keep the machine properly lubricated. Most accidents actually happen when changing the blade, and even a dull blade will effortlessly remove fingers if one is not careful (yikes!). & just about all other paper and film based materials we sell. Please inquire as to your needs! As with any new toy, we’re stoked at every opportunity to fire this bad-boy up! Yay! This is good news. She's a beauty! TALAS | Articles | TALAS News | TALAS Gets a Guillotine!